Sharks’ attraction to undersea fiber-optic cables has been well-documented over the years. The Internet is a series of tubes … that are sometimes attacked by sharks. Now it seems Google is biting back. According to Network World’s Brandon Butler, a Google product manager explained at a recent event that the company has taken to wrapping its trans-Pacific underwater cables in Kevlar to guard against shark bites. It makes sense that Google would be investing in better ways to protect transoceanic data cables. Over the years there have been several instances in which damage to undersea lines resulted in widespread disruptions of Internet service. Dependable network infrastructure has become increasingly essential to Google’s business, which relies on ultra-fast transmissions of information between its data centers around the world. On Monday, Google infrastructure czar Urs Holzle announced that the company is helping to build a new trans-Pacific cable system connecting the United States to Japan at speeds of up to 60 Tbps. “That’s about 10 million times faster than your cable modem,” Holzle noted. Google’s partners on the project include China Mobile and SingTel. 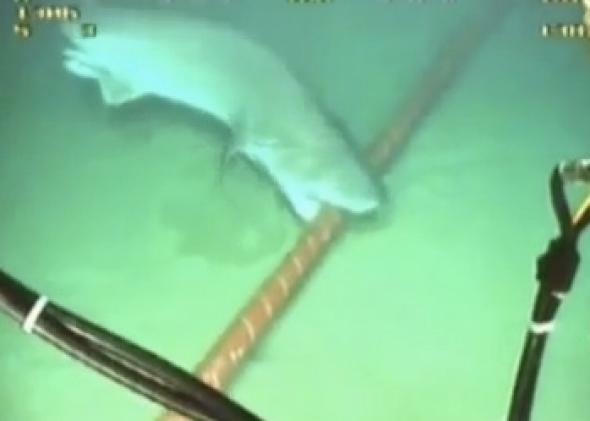 Why are sharks attracted to undersea data cables? Unclear. Several outlets have pointed out that sharks can sense electromagnetic fields, so perhaps they’re attracted by the current. Alternatively, a shark expert from Cal State-Long Beach suggested to Wired, they may just be curious. Anyone with a dual expertise in chondrichthyan behavior and electrical engineering is warmly invited to offer a more compelling explanation in the comments below. Forget Google vs. Apple, Google vs. Amazon, and Google vs. Facebook. My new favorite tech rivalry is Google vs. shark.